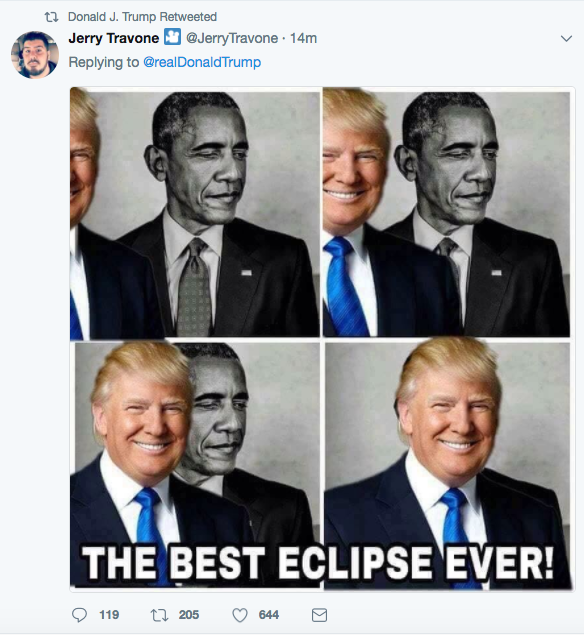 Trump quickly retweeted the eclipse meme. The man who sent Trump the meme is Jerry Travone, who calls himself a “YouTube actor and political junkie” (he posts videos of amateur wrestling and video games on his YouTube channel). On his Instagram and Twitter, Travone has regularly posted anti-liberal memes blasting the “violent Left,” Black Lives Matter movement, transgender rights, feminism, and undocumented immigrants.